I know that I walk a lot more in Japan than at home. At home, I walk around the house and the office, but I drive everywhere else. In Japan, I walk to the train, from the train, to meals, from meals, up stairs, down stairs, and sometimes just around and around the hotel room at 3am. For a couple of weeks before my latest trip to Japan and for the entire week in Japan, I wore a pedometer to see exactly how much more walking I do in Japan than in the U.S. In the weeks before the trip, there were a couple of days that I thought I was relatively active. I mowed the lawn wearing the pedometer. I coached soccer wearing the pedometer. I visited a colleague at Georgia Tech and walked around campus. I took a family vacation to Callaway gardens and spent an afternoon hiking and biking around. Surely those active days would be on par with a normal working day in Japan. Nope. Only the day hiking around the park had more steps than a normal working day in Japan. 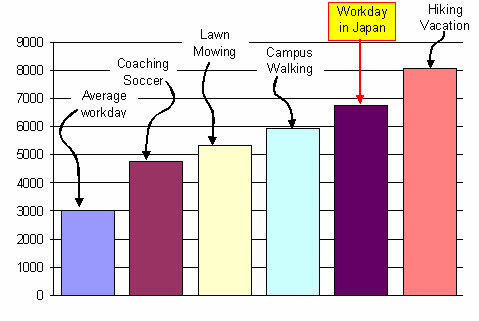 A normal working day in Japan takes almost three times as many walking steps as an average day in the U.S. It would be interesting to compare with more pedestrian-friendly cities in the U.S. to see where a normal working day falls for folks there. In the meantime, I need to rest for a while. Perhaps a 13 hour flight will suffice.